In the late 1940''s Wedgwood commissioned Leighton to produce a series of 12 wood engravings. to represent the traditional industries for which New England was famous, including Whaling (Massachusetts, especially Nantucket), Marble Quarrying (a Vermont specialty), Lobstering (associated with Maine), Tobacco Growing (Connecticut), Maple Sugaring (Vermont and New Hampshire), Cranberrying (Massachusetts), as well as a variety of traditional activities found in all New England States, and many other northern or coastal States, including Ship Building, Logging, Farming, Cod Fishing, Grist Milling and Ice Cutting. 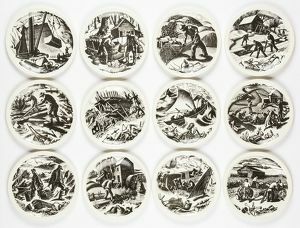 The original twelve wood engravings themselves were produced in a limited edition of 50 sets, individually numbered and signed by the artist. Wedgwood then adapted these engravings and transfer printed them onto 10.5 inch dinner plates.